Blinds are interior decoration elements known to go with different styles and tones of the entire room, enhancing its aesthetics and functionality. Blinds are a good space-saving solution when there is no room either side of a window. Are you looking to transform your living area and make the place look elegant and fascinating? Made 4 U Shades Blinds & Shutters, your reliable provider of blinds, shades, and shutters brings you some of the latest trends in blinds. Whether you are dressing your windows to add privacy to your room or to improve its looks, these ideas will give you an inspiration using the trends in blinds design to make your room more fantastic. Grey blinds are a trend adopted by lots of homeowners to enhance the look of their home. A grey blind adds style, and a contemporary feel to a room. Using different colors on the slat panels of blinds is one of the trendiest ideas of decorating a home using a blind. These forms of blinder create a fun and a quirky effect to the room. It acts as an element of surprise to a room. It is perfect for a children’s room due to fun effects it generates making a room feel lively. As layering is trending this year, a combination of blinds and curtains allows the functionality of the blind to be modified and improved. It makes a room feel elegant at the same time achieving privacy. This works best for roll-up models of blinds that are held up with a tape. Curtains add visual effect to a room. Hang lights curtains to bring elegant and artistic feels to the room. Hang heavier curtains to act as a soundproof and add insulation to a room. 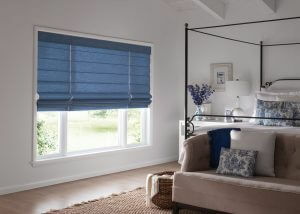 Using a styled rod to fix the curtain will also make a blind and the room appears contemporary. A London blind has floral linen which creates a soft effect on a room. It makes a room appear cozy and warm. It functions efficiently with the vintage feel of the scheme. This is the cheapest way to add layering to the room as it provides a simple and clean feel to a room. A matching color with the walls of the room can be easily selected using the roller blinds to make a room look uniform and exquisite. There are even motorized roller blinds that they pair very well with drapes. One can determine the look of a room using any color of the Roman blind. Roman blinds offer an impressive look to a weird-shaped window. Where curtains and drapes may not fit properly. You can use colored Roman blinds to add a relaxing feel to the ambiance of a room. There you have it! The above are some of the latest trending in blinds to help beautify your living area. Window treatments are jewels of the home. Therefore it is important to make your home look grand and modern with the new trend of blinds to decorate your home. Using any of these ideas, you can make your home look luxurious, sophisticated and enticing. Will you like to improve your window treatments? Get in touch with us today at Made 4 U Shades Blinds & Shutters. We have a collection of blinds, shades, and shutters that will help transform your living area from ordinary to simply stunning.